Hey everybody! I made up this tee for my husband and a handful of family/friends, and I've got one left over. I'd like to give it away as a thank you to everyone who's been encouraging and supporting me as I work to be a contributing member of the Magic community. Twitter followers, Facebook friends, the folks at our local game shop...y'all rock. Since my Creative Suite skills are still in process at this time, the text layout was done by local print shop Fishead (the best customer service ever, located just outside of Portland in Milwaukie, Oregon). 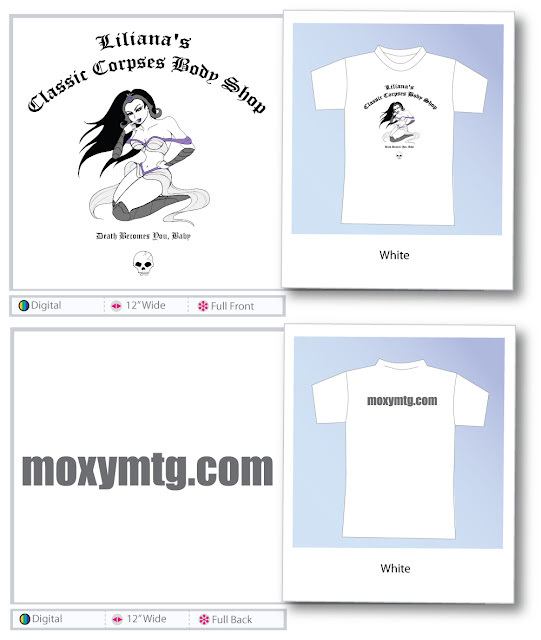 The shirt features a pin-up style Liliana Vess designed by me. If you are interested in being entered in the drawing for the remaining size medium tee, please leave a comment below, post on my FB wall, email me, or Twitter @ me in the next 24 hours so I can let you know if you win! Drawing will be held Wednesday evening. The shirt is a regular cotton tee, no fancy American Apparel yet. ;) This was a personal project so this particular design will not be reprinted. Many other designs to come, however!